Lac du Bourget is the largest and deepest lake entirely in France. It’s only 25 kilometres south-east of the better known Lac d’Annecy. Surrounded by mountains (Alps and Juras) there are lots of quiet and interesting cycling climbs on all sides, including a couple of the toughest in France. Below are a few ride ideas featuring the best cycling climbs (18 cols): I’ll briefly discuss each route shown on the map below, with a link to a more complete description. Green route on map – The 52 kilometre lake loop is excellent. The east side is completely down low, along-side the lake – the majority with bike lanes. 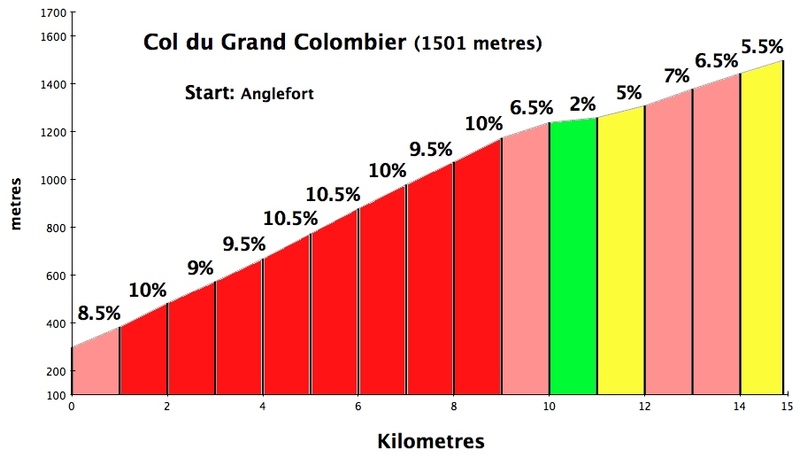 The very fun west side has some climbing, passing the scenic little Col du Chat and plenty of great views. On the map, I added 8 kilometres to the loop by doing a 4 km “there/back” in the north-west corner, to visit the lovely Abbaye d’Hautecombe. Dark and Light Blue Routes on map. 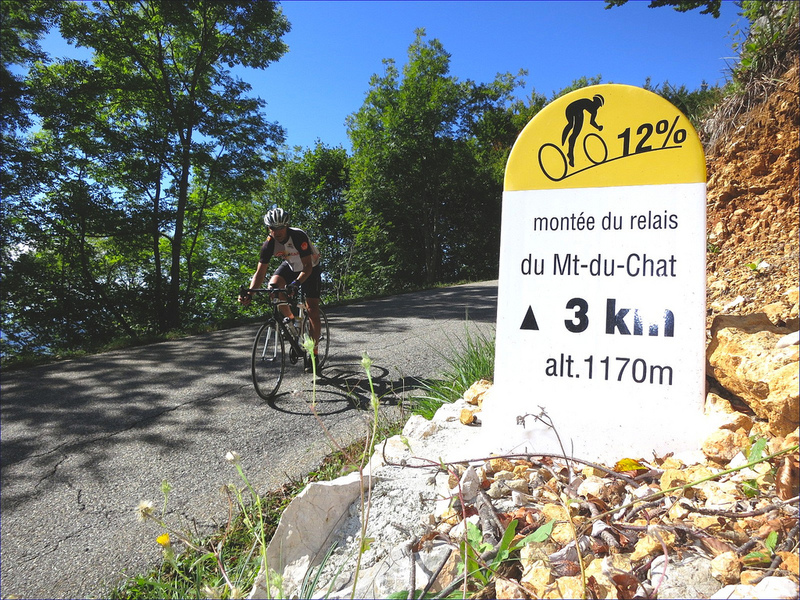 Dominating the west side of the lake, Le Cycle magazine once called Mont du Chat possibly the toughest cycling climb in France. I think there are harder, but starting from the lake itself, the west side is consistently brutal. Mont du Chat can be combined with Col de l’Epine (see here), or Col du Chat (see here) to make excellent, quiet, challenging loops. 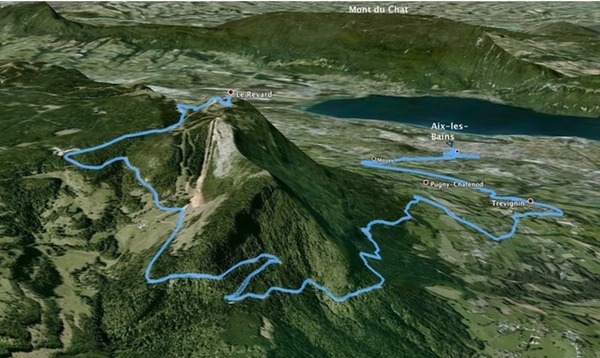 Or skip the super steep Mont du Chat and make a superb loop with Col de l’Epine and Col du Chat (see here). EDIT: Here is an excellent recent (2017) loop that climbs Col du Chat then returns via the back, west side of Mont du Chat – that will feature in the 2017 Dauphine and Tour de France. It’s a slightly longer version of the blue route on map. Brown route on map. 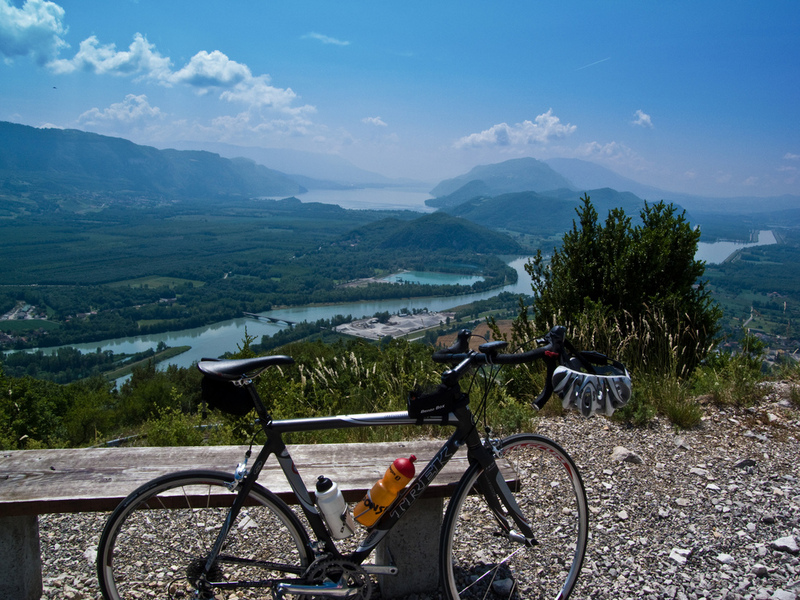 To the north of Lac du Bourget is the redoubtable Grand Colombier, part of the Jura mountains (don’t confuse this Grand Colombier with its more famous – but easier – Alps neighbour: Col de la Colombière) . 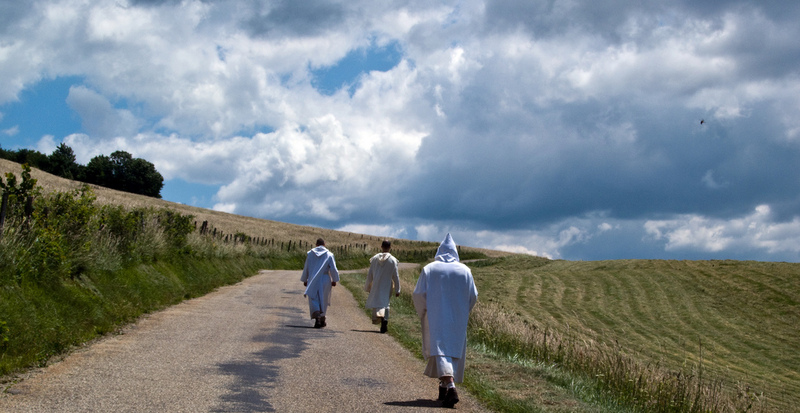 Cycle all four sides of Grand Colombier to become a Grand Master of the Confrérie des Fêlés (brotherhood of the crackpots) du Grand Colombier – roughly as difficult as all three sides of Ventoux. Best of all, the road is near deserted as there is nothing much up top (nice hiking, some cows) and lower roads link the different valleys below. For details of all four side – see here. 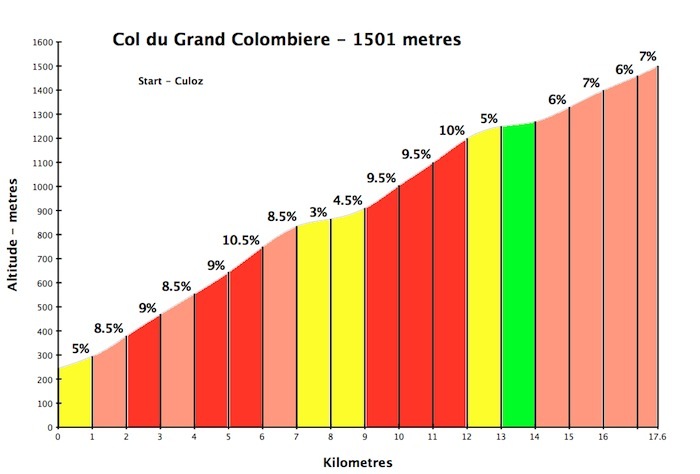 Edit: Here’s a 2017 ride that visits two climbs in the 2017 Tour de France Stage 9: the super tough Col de la Biche then the steepest way up Grand Colombier. Dark and light red routes on map. Above the west of the lake, is the huge massif of Mont Revard. 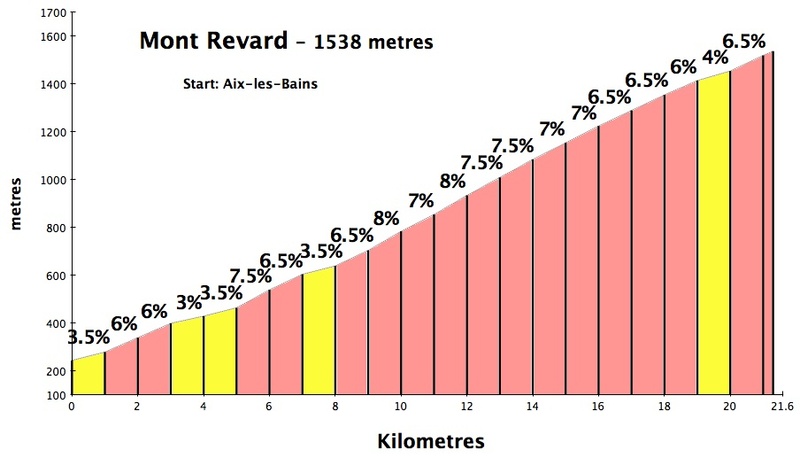 Longer and less steep than Mont du Chat and Grand Colombier, however, the summit of Mont Revard is slightly higher than the other two. The northern route up can start by the lakeshore in the spa town of Aix-les-Bains – see here. Or one can climb from the south starting near Chambéry via Col du Plainpalais – see here. Orange route on map. 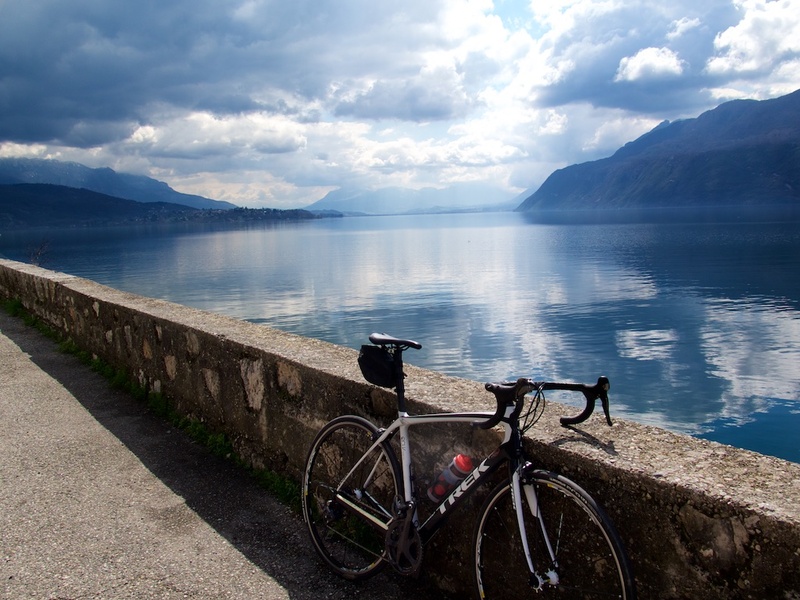 Above the north-east part of Lac du Bourget are 4 Cols that can be combined into one great ride – see here. 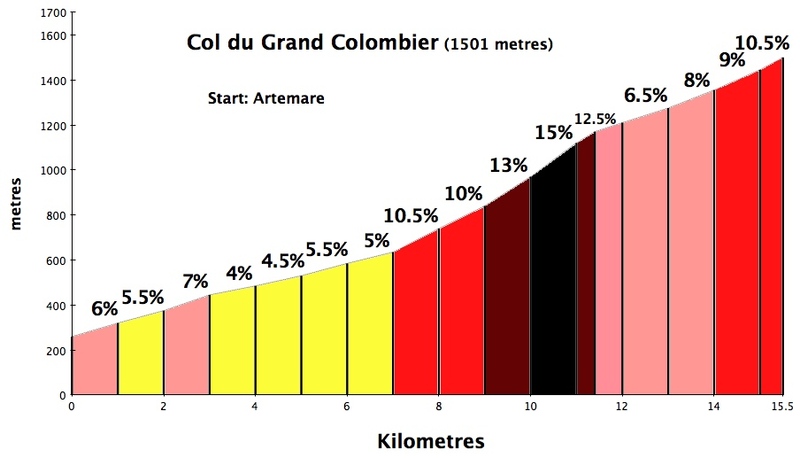 Col de la Chambotte, Col du Sapenay, Col du Clergeon, and Col de Cessens. Here’s another ride with the same cols in different order and also the Gorges du Fier. Purple route on map. 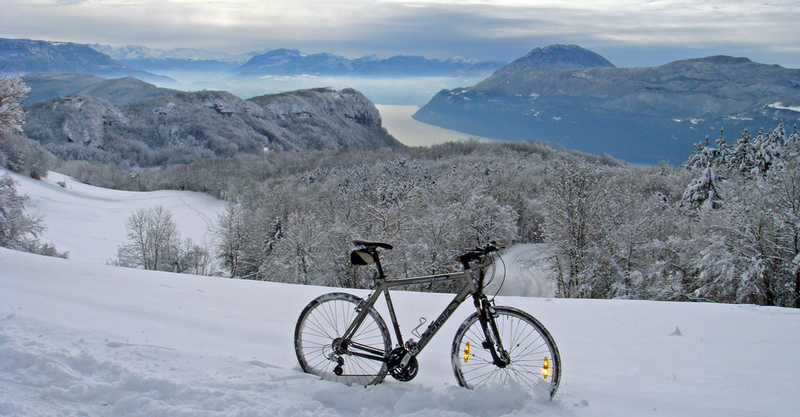 From the south tip of Lac du Bourget is a great bike-only trail to nearby Chambéry. South of Chambéry begins the Chartreuse Alps. 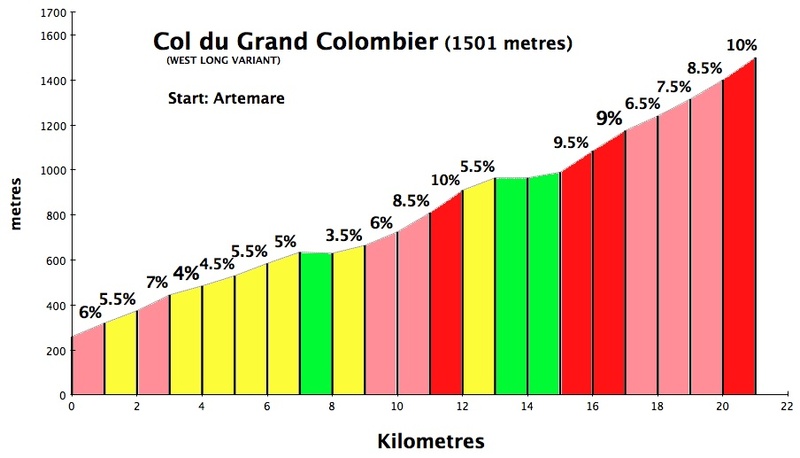 Here is a 6 col loop starting from Chambéry. For more rides in the Chartreuse Alps see here. Pink route on map. A little off the beaten track, and not really beside Lac du Bourget, here is a very quiet Jura mountain loop that passes by a Chartreuse monastery at Col de Portes, and also climbs Col du Ballon. Not quite in the Alps, Lac du Bourget and its surroundings is usually ignored by cyclo-tourists. Hopefully, this quick survey of the region will motivate some of you to visit a few of these quiet and challenging roads. Hi Chris, It’s definitely a confused subject. I must admit I also usually use the rule of thumb: “which side of the Rhône a mountain is on,” at least in my neck of the woods. But, I usually am proud to correct people that Mont du Chat is Jura not Alps. 🙂 Still my initial reaction was to chide myself for the error and agree with you. 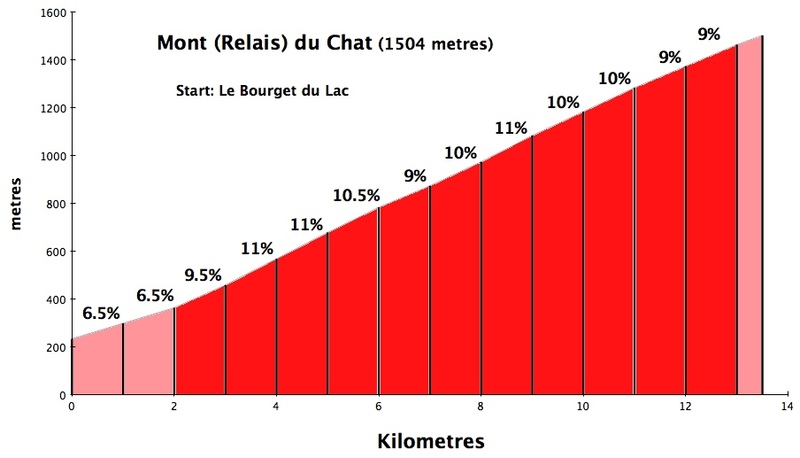 So how about Mont du Chat? Geographically an Alp and Geologically a Jura? I would say so, yes. Unfortunately, when using the geological division it is hard to decide on where the Jura/Alp boundary is, because the Chartreuse is Alpine and there is not much of a dividing line between that and the Mont du Chat ridge. That’s partly why I prefer the geographic division using the Rhone river, because that makes things simple. Le Jura descend très bas, incluant bien sûr Colombier et Mt du Chat / Epine mais aussi col de Chambotte, col du Sapenay, col du Clergeon, et col de Cessens. – Le montagne du Grd Ratz (entre Voiron et Voreppe) est Jurassienne, tout comme l’Aiguille de Chalais qui fait pourtant partie du Parc Naturel Régional de Chartreuse. On peut donc classer la rude montée à l’abbaye de Chalais comme une montée Jurassienne. Cela est expliqué au sommet, point de vue du rocher de Bellevue. – Egalement la dent de Moirans, de l’autre coté de la cluse de Voreppe, extrême Nord de ce que l’on considère comme le Vercors est également une montagne Jurassienne. A part ça, encore un bel article ! Pingback: Cols Clergeon, Sapenay, Cessens, and Chambotte. Plus a Gorge.